Brickell Heights West, also known as Brickell Heights 02, is the second of two towers comprising the two-tower development called Brickell Heights. Rising 47 stories, Brickell Heights West is the shorter of the two towers. The all-glass skyscraper was designed by famed architecture firm Arquitectonica with the commissioned facade installation completed by renowned Argentinian artist Fabian Burgos. 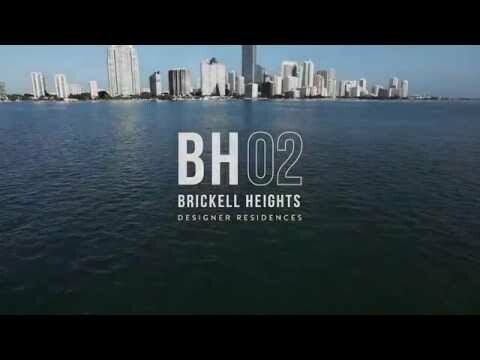 Completed in 2017, Brickell Heights West was developed by The Related Group in collaboration with Crescent Heights. Brickell Heights West includes 332 condo residences comprised of one and two-bedroom floor plans plus penthouses (see Brickell Heights West floor plans). The amenity spaces at Brickell Heights West were designed by celebrated interior designer David Rockwell. Brickell Heights West residents have access to a plethora of luxe amenities, including a 35,000 square foot, 3 story Equinox fitness center and spa; SoulCycle spin studio; rooftop pool and sundeck; 9th-floor swimming and lap pools; two club rooms; screening rooms; business center; 24-hour valet parking; kids’ room; 24-hour concierge; and more. The residences at Brickell Heights West feature 9-foot high ceilings with floor-to-ceiling glass windows, GE Monogram kitchen appliances, in-unit stackable washer/dryer, imported stone countertops, and contemporary European cabinetry. Brickell Heights West condominiums is located at 55 SW 9th St, Miami, FL 33130. Sitting in the middle of all that Brickell Miami has to offer, Brickell Heights West is within two short blocks of the shops, restaurants, and entertainment at Brickell City Centre and Mary Brickell Village. Additionally, by car, Brickell Heights West is a short distance from the sizzling nightlife of South Beach, Museum Park, American Airlines Arena, and Wynwood Miami. What are the rental restrictions for Brickell Heights West condominium? What is the pet policy at Brickell Heights West condominium? Brickell Heights West condominium is a pet-friendly condo development for both owners and tenants. The pet policy permits each unit no more than two (2) pets with no weight or size restrictions. Which utilities are included in the Brickell Heights West condominium association dues?